Published as a partnership between Durham University, the RSPB and Lynx Edicions in association with the University of Cambridge, BirdLife International and EBCC. Results are presented in detail for 431 species; brief accounts are also included for a further 48 native and 16 introduced species. 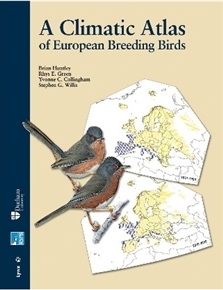 The contents of the volume include: outline accounts of climate and vegetation patterns in Europe; a biogeographic analysis of the breeding birds of Europe; a review of the background to studies of the relationships between species’ distributions and climate; a discussion of the methods used in such studies; a summary of how European climate is projected to change by the end of the present century; a discussion of how species respond to climatic changes; for each of 431 species, a brief account of their distribution and ecology, maps of their recent observed and modelled geographical distribution, and of their potential future distribution in the late 21st century, a graphical representation of the location in climate space of the species’ distribution and text describing the possible effects of climate change on the species; a synthesis and discussion of the results for the ensemble of 431 species examined; and a concluding section exploring the implications of these results, especially with respect to the conservation of birds in Europe. The many maps and diagrams this volume contains, as well as the succinct accounts of the distribution and ecology of the 431 species examined in detail, offer much that will be valued by the amateur and professional ornithologist alike. The introductory, review and synthetic material will also be of interest to a wider range of biologists and conservation scientists, as well as to those in government and non-government organisations addressing issues relating to biodiversity conservation, both in Europe and beyond. Climate change affects all living organisms; it has done so in the past and will do so in the future.